Very timely! My organization (for whom I've recently become main-blog-wrangler) is right now starting to go through a transition from a very professional (and thus somewhat impersonal) voice in all materials, including online, to something a bit more human. It's helpful to see this articulation of the value of personality coming through in a good way. 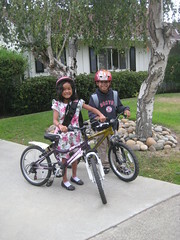 On a personal note, it's awesome that your kids are biking to school. It's going to depend on each nonprofit's situation and exactly who these staff members are and the level of trust already there between managers and staff. You want to have a pretty good idea that staff won't embarrass the org, and if they do cross some line, that you'll know in advance how to handle it. But let me make a point about how valuable sharing the personal can be by explaining some decisionmaking I'm doing now as I write my book. I need to include good examples. I have a million different nonprofits to choose from. Yes, I need to highlight nonprofits that illustrate a particular point I'm making in the book, so that's pushing me toward certain groups. But what is also driving my choices about whom to include is whether I feel like I personally know the staff at the nonprofits in some way *and* like them. I've met very few of these people in person. They are almost all online friends. And I'm finding myself thinking, "I really like Fran. And Steph. And Danielle. And Lane. And on and on. I need to find a way to get their orgs in this book." How do I know I like them? By not just the professional, but also the personal info they post on Facebook, Twitter, in my blog comments, and in personal email they send me. I don't think this is all that different from how a donor would react to personal information about nonprofit staff. You want to give something valuable (whether it's money or time or national exposure in a book) to the people you LIKE. It seems to me that over recent decades the concept of professionalism has become increasingly divorced from the realm of values to basically mean mere efficiency or competence without regard to the ends served. Yet for work to be any good presumes that it does some good. Great post Beth and also timely for me. I had a conversation with our agency's CMO yesterday around elevating our social media presence, and this was a key topic. Lots of folks with traditional marketing backgrounds have trouble (or minimally a lack of comfort at times) weaving in the personality to controlling a professional image. I couldn't agree more that the personal side reduces the barriers to building connections and will make a strategy in social media more effective - thanks for providing examples. At jhr (Journalists for Human Rights) we've been exploring the level of personality to infuse into our social media since we launched a more formal policy a couple months back. We've found that with an organization such as ours that still has a very strong grass roots following, infusing personality into the work that we do is incredibly important: many of our supporters know our staff by name and seem to really appreciate the personality behind our organization. We're able to stay personal because we only have 9 office staff in our North American office. Does anyone have some examples of much larger non-profits that have maintained a genuinely person feel? I agree with Paul Maurice Martin: the concept of professionalism has become divorced from it's core idea. In my job, serving in an HR-type role to many millenials, I often hear the term "unprofessional" hurled around in contexts where it is essentially meaningless. The concept of "professional" is applicable to "professions"---like lawyers, accountants, certified fundraisers---in which there are distinct rules and norms that cross organizational boundaries. These "standards" of professionalism are often developed and maintained by national (or international) certifying organizations. Instead, in these day to day situations, it's not a matter of "professionalism" but one of organizational culture and supervision. Yes, calling someone "unprofessional" is part of the cultural norming process (because it has such a strong shaming effect in our culture), but as I explain to bother supervisors and their charges, it's essentially meaningless in the supervisory context. Instead, you should be explaining policies, expectations and consequences (using something like the DESC Model). I would say that the friction comes more from a split between the short-term human process and the long term outcome expectations of the corporate organization. As a whole, the organization is expected to have the "correct" answers and the "best" outcomes. But as we know, there is a lot of mushy human middle getting there. Most people expect your organization to be a black box that occasionally pushes out a product. I hate to bring up the sausage factory, but social media opens up a window for outsiders to see how it's made---and it often isn't pretty. People make mistakes, change their mind, learn something that people "expect" them to already know, or just plain misspeak. I think it's a split between what your organization's values are: do you want to be seen as *having* the best answer, or do you want to be seen as being able to *develop* the best answer. Social Media supports the latter, but neither option is inherently better than the other (though I personally lean towards the latter... but that's because I'm a process kind of guy). One thing that Chris Brogan does very well is that he takes a "one-to-many" conversational medium (posting to a blog, tweeting) and makes it feel very "one-to-one". He does this, in part, by being a person - a person who feels blue at times, makes mistakes, and goes off topic. Yes, it is a balancing act - how much do you want to open up? What's comfortable? And what's just too much information for your network/audiences/readers. I try to be as human as possible, share my personality, but try not to cross the line into oversharing. What do you think that line is? How do you define oversharing? This post is near to my heart and it's a tension that all of the audiences I talk about social media with want to explore. You know my take - I think it's important to be personal, in a way that works for your nonprofit and its needs. At NTEN, we think it's important that our members know who WE are as people. So we're all very personal in our use of social media. Sometimes that means tweeting about my wonderfully fantastic daughter and husband. More often than not, it means doing our work with a personal voice - announcing that new blog post in a tone that's personal, not organizational. The balance is hard, but worth it. This is not to say that I don't get annoyed. I've never tweeted my political opinions, for example, though I have MANY and sometimes see tweets that I desperately want to respond to. While I think we do a good job, I'm sure you could dig up some folks who think that we are unprofessional as well. But we are who we are as an organizations, and if folks don't like who we are, we probably can't afford to try to please them anyway. It is most certainly a gray area in terms of how personal is too personal. I think one of the main goals is establishing that relatable personality while still fulfilling the overall practical purpose of your professional blog, comment responses, facebook status updates, etc. 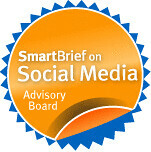 This takes practice and testing the water among your different audiences in various social networks/setting. Offline or online, people need to know people first! As we all know in fundraising, people give to people. With the almost infinite access to people in the universe to share your message with, you will not get anyone's attention of interest unless a spark of personality intrigues someone to read further. I place a high value on constant in person watercooler conversations with my staff to distill a set of common passions, party lines, and enthusiasm that resonate with our mission yet allow for the personalities of each person to individualize the message. That way, people have a layered and organic sense of the organization while developing a relationship with a human being that brings an oh-so-valuable personal touch to the dialogue. I love the photo of your kids on their bikes and the metaphor of "entering new social media territory"! It brings me into your world and allows me to imagine new strategies facing me on "the big day" just as vividly as you did. Perhaps I will practice a test run on a new social media network so that I can ride confidently to school on my first day with a confident grin. Great post and comments. I, too, find that I get the most response to posts that weave reflections on my own life (for me, as a mom to 3 young kids) into my thoughts on organizing and policy advocacy. The only thing I'd add to the thoughts of others above is that some professions have ethical codes that may place these decisions in a different, and somewhat more formalized, context. For example, as social workers, we have to avoid dual relationships with clients that can be harmful to the client (and it's often impossible to know what that means). So, when I'm working with social service organizations that have blogs or other social media presence, they have to figure out how to humanize the organization for donors/volunteers/stakeholders, without opening their social work staff and the clients with whom they work to multiple relationships that can cloud their professional work together. There is no 'line' that we can really navigate; it's another one of the areas that requires tremendous professional discipline, lots of reflection, and communication with clients as we walk it. Thanks for pointing out the issue that social service agencies have. One way to discuss it is play out a scenario that is offline where there is a situation that is harmful because of this issue - and then see how it translates online. If anything, it is great fodder for discussion and can help an organization identify a good policy. I wonder if all the doctors who blog or even tweet, have that problem as well? Yes, for social workers at least, these aren't new quandries as much as they are slightly more nebulous variations of one of our profession's core ethical dilemmas--how to be real and authentic with clients while not unethically eroding boundaries that are created to protect clients. I'm not nearly as familiar with other professions' ethical codes, but I would imagine that we're not alone in struggling with this.